Like every good stage show, Alice Haefeli: A Camp Life is a story with three distinct but intertwined acts. It starts with a musical theatre burst and ends in a bit of a mystery (leaving the audience wanting more, of course), but it’s clear this show is on the right track, and will have an ending that will leave you satisfied. When we first meet the star of our show, Alice is starring as a witch in Sir Gawain and the Green Knight at musical theatre camp at age three. The theatre bug clearly bit her early on, but the camp bug left an impression that would manifest itself much later on. At this “camper stage” of the show, Alice only really visits camp a few times, including whale camp in Canada and an overnight camp in Cape Cod. Most camp shows don’t get off the ground with so little exposure, but Alice shows determination and grit as she discovers who she is, and as the second act opens, the audience is leaning in towards the stage to see what might happen as the plot unfolds. Act Two of Alice’s life is where we begin to see the transformation from camp lover to camp evangelist. 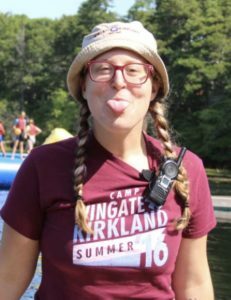 She spends six years serving in a variety of roles at a New Jersey day camp, and begins to understand the power that camp staff have on the life of their campers. Although camp staff don’t always walk on water, the impression that they might just be able to pull that off means that counsellors and program staff can make a serious impact on the life of those in their care, and Alice finds herself drawn to that power. The question remains: can she wield that power in such a way that she can change the world, just like those who’ve gone before her? The third act of Alice’s camp career, the denouement, is still unfinished. Here the musical takes a bit of a sideways turn as she waits (in the wings?) for the path forward to become clear. Alice has moved from the realm of summer staff into the world of year-round, dedicated camp staff. It’s a waiting game, of course, with so many opportunities open to her that the plot isn’t immediately obvious. “My dream is to start something new and fresh, something that’s my own,” she says, looking with bright-eyed optimism towards the future. She believes that camp makes people into well-rounded humans, and she wants to be there to help campers become who they need to be. One can’t help but be impressed by her sheer positivity, even in the face of earlier mornings, camper issues and staff care. That optimism is what ultimately wins this reviewer over: no matter what the road looks like, her confidence and dedication have convinced us that big things are to come. We’re already looking forward to the sequel. Maggie Mitchell is the Overnight Camps Director at Camp Copneconic, a 700-acre YMCA camp just south of Flint, MI. With a Bachelor's degree in teaching and a Master’s in public administration with a focus on educational leadership, Maggie is well-suited for her role in providing a memorable camp experience for as many as 500 to 600 kids each week. The Y’s core values of respect, responsibility, honesty, and caring reflect Maggie’s own, and the programming she oversees reflects her own belief in the importance of a supportive and engaging community. Maggie’s introduction to summer camp was when she attended a camp designed to prepare her and the rest of the rising 6th graders for their new life in middle school. As an only child, Maggie loved spending time with other kids, and this week of camp was nothing short of amazing. Maggie later returned to the camp, which had relocated to Camp Copneconic, as a high school chaperone. 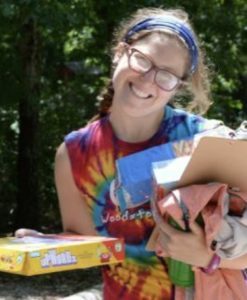 It was during her senior year’s service that her future boss identified her caring and enthusiastic interactions with campers and invited her to apply to be a regular camp counselor. Maggie’s first year as a counselor proved to be a transformative experience for her and the direction her life would take. It was at camp that Maggie would find her calling. 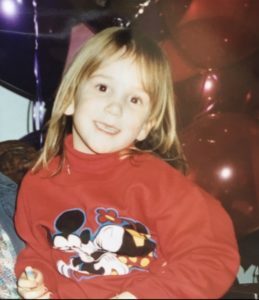 It was camp that caused her to change her major from nursing to teaching on her very first day of college, and it was ultimately camp that led her away from teaching school to teaching (and more!) at camp years later. 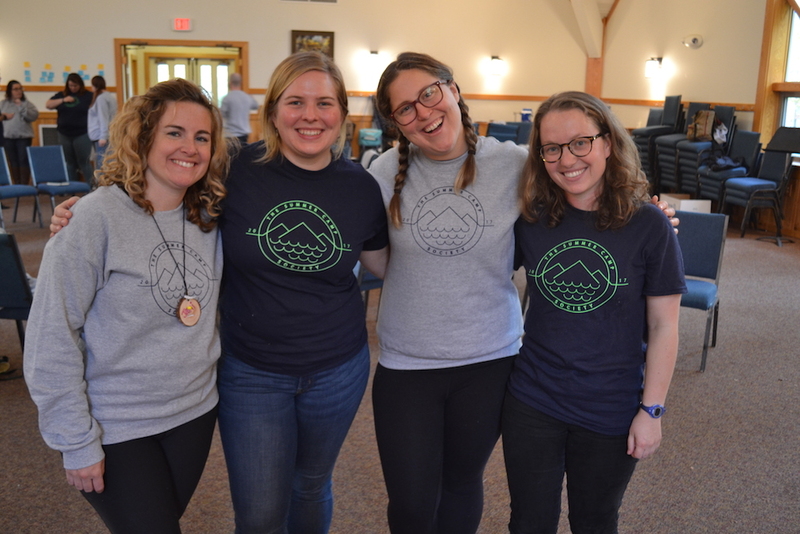 Over the next several years, Maggie served in many different roles at both Camp Copneconic and Cheley Colorado Camps, each preparing her for where she is now. Some people call their job “work,” but for Maggie, it’s home. Camp Quest while struggling to find a camp for her children that was open to campers/families with humanistic beliefs. She found that not only did Camp Quest's open-minded nature fit with what she was searching for, but the general camp culture was something that she was personally drawn to. Amy is one of those people who you instantly feel connected to; someone you feel comfortable around before you ever really know her. Her warm persona and bubbly personality give her that “camp mom” feel, even when just speaking to her over the phone. So naturally, she fit right in to the world of camping. Amy started her journey with Camp Quest as a counselor in 2010 while her oldest son attended as a camper. It was after this week that Amy knew this was going to be more than a “one and done” ordeal. Since Camp Quest is independently run by volunteers, Amy decided that she wanted to start her own session. The very first year, Amy started off with 35 campers. Now, her camp has grown to averaging 115-120 campers per session and is opening up a third site in the Southeast Region. 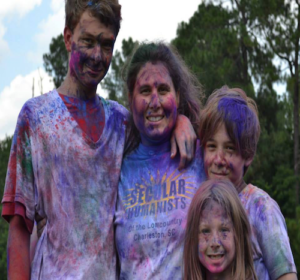 With camps in South Carolina, Mississippi, and one opening in Florida, Amy dedicates a lot of her time, energy, and heart into making Camp Quest the best it can be, year after year. Though only “required” to speak for 15 minutes for the purpose of this interview, Amy and I found ourselves chatting for over an hour about the impact camp has had on us and our lives in general. We focused on that impact and realized that that’s part of the pull; the thing that keeps us involved with camp and makes work feel less like…Well, work. When we’re at camp, we feel like we’re a part of something bigger than ourselves. We feel the work we do and see the impact it has on others. Amy said it best when she said, “You live on through the legacy of the work you do.” Luckily for us, we get to work on that legacy every day. I love creative programming and getting to come up with radical, new, out-of-the-box ideas. I love to encourage counselors to do the same and come up with their own crazy ideas. I loved being a counselor with all my heart and soul and I love training counselors to do the same. My motto is “The answer is always yes, unless it has to be no”. What was the most challenging part of your job last summer? Finding balance between what I have to do in the office and what I want to do out around camp. I have found that the days I spend more time in the office are the ones that are the most challenging. I also feel that being a relatively young director, close in age to the staff, can also be challenging. Do you have a mentor in the camping world? Megan, who is the previous director at Farnsworth. She was the camp director when I was a counselor and we also worked together at another camp as well. She is definitely my go-to human. What is a piece of advice that someone has given you that you still reflect on? A director that I used to work for told me that “perfect is the enemy of great”. I think about it a lot when I know that I am obsessing over something or not willing to release a project because I don’t feel that it’s good enough yet. One of the staff this summer told me “you’re good but you’re not God”, which I think is another way to say the same thing. What is a piece of advice that you have for other Camp Directors or staff? The rule I live by that I think is most important is to remember why you do it. I don’t think that many people wandered into the camp world by mistake. They are here for a reason. You also need to keep an eye on the person that you were as a counselor and how you can bring that level of passion back into camp. What do you hope to gain from The Summer Camp Society? I think I am just looking to learn from other people. I want to learn what trials are common so that we can brainstorm solutions. My big dream is to one day open my own camp, and I want to learn what awesome and unique things are being done and what I can pull from that. Can you tell me more about your future camp? I think it will be a private camp; I tend to lean towards the radical side of working with youth. I have too much of a desire to push for radical exploration to fit in with the molds of a structured organization. I love the idea of Adventure Playgrounds where kids can engage with the world around them to learn. I intended to teach before I found camp and I wanted to be in Montessori, so kid-guided discovery was always something that I believed in. What is one happy camper (or staff) story from this past summer? I had a new counselor who was trying to internalize my message of making camp unforgettable. She had a camper who was very upset because they had received a letter from home that said their family was going to go on vacation to Maine without her while she was at camp. The counselor asked what it was that the camper really wanted to do in Maine and she responded that she wanted to surf. The counselor then rigged up a bunch of canoes tied to a windsurf board and had counselors paddle the canoes so that the camper could surf at camp. It was just the most camp answer to the problem. The years where I was a unit leader were the best. I never felt like I was as good as something as I did then. I loved getting to do awesome things everyday with cool teenagers. I truly woke up thinking “this is great, we’re going to do something awesome today”.